The USB-C Hub is designed for extra connectivity demands. 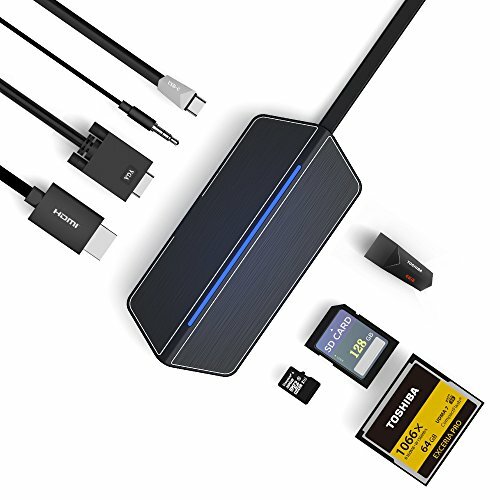 With the Hub, you can extend the Connect the attached cable to your laptop's or phone USB-C port and get display and device connectivity with VGA or HDMI, USB 3.0, stereo, and Multi-Card Reader. With its lean, lightweight design, the USB-C Hub easily slips into a bag or pocket for massive on-the-go connectivity. Now you can pick up and go whenever you need, but still have the ports your productivity demands. 2.Support resolution up to 1920*1080P of HDMI and VGA port for video out. These two video output port can display simultaneously. 3.Backword compatible with USB 3.0 and USB 2.0. 5. USB-C female port support charge for internal device or the product itself.